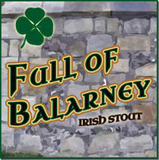 Irish eyes will smile on you with this special draft-only release just in time for St. Patrick’s Day! With a rich but light body, roasty aroma, and clean dry finish, this treat is no balogna. And to add to this stout’s charms, it’s meant to be served on nitrogen!